Overclockers UK, caught in the middle of a fight between the the light and the dark side, decided to supply weapons of mass power to both! and wield your lightsabre as part of the Sith lords. Harness the most powerful consumer graphics card available today, use the power of the (Ge)Force to destroy your enemy! Featuring the Intel Core i7 8700K Hyperthreaded Six Core Processor in the stunning, bold, Lian Li Alpha 330X case, finished in glass and Aluminium. The OcUK Gaming Galactic is designed to be an imposing, eyecatching centre-piece to any gaming/streaming set up! 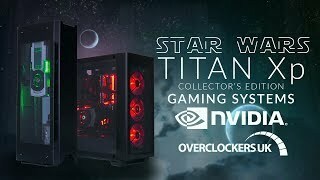 More links for "Galactic Gaming PC - Nvidia Titan XP Star Wars Galactic Empire"